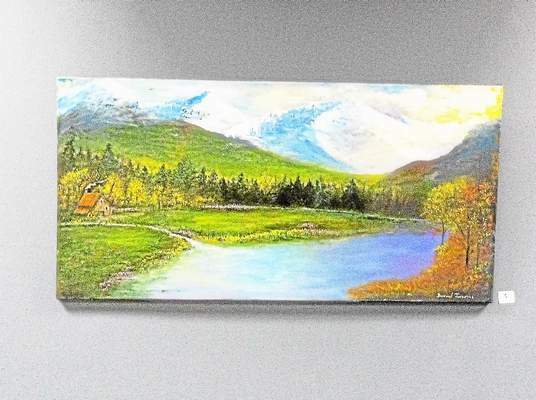 TORRINGTON >> New Preston native Paul Sakren is the March artist of the month at the Newsroom Cafe. Sakren, who describes his art as have a cartoon feel, has 21 paintings on display, some have an abstract feeling, like in “Download 10,” or a cartoon feeling, like in “Download 3.” Sakren said he tries to evoke a feeling of being transported to another world in his painting and his landscape design. He is self-employed as a landscape gardener and designer. Sakren has been painting for over 20 years, is “mostly self-taught” but he has taken various art courses at Northwestern Connecticut Community College. He typically paints with acrylics but says he’ll sometimes use oil or watercolor. Read the full article on RegisterCitizen.com. A box of donated items at the Register Citizen which will be distributed as “Compassion Kits” to the homeless population around Torrington. Reporter Jenny Golfin reflects below on the success of her collection of “Compassion Kits” to be distributed to the homeless population of Torrington. 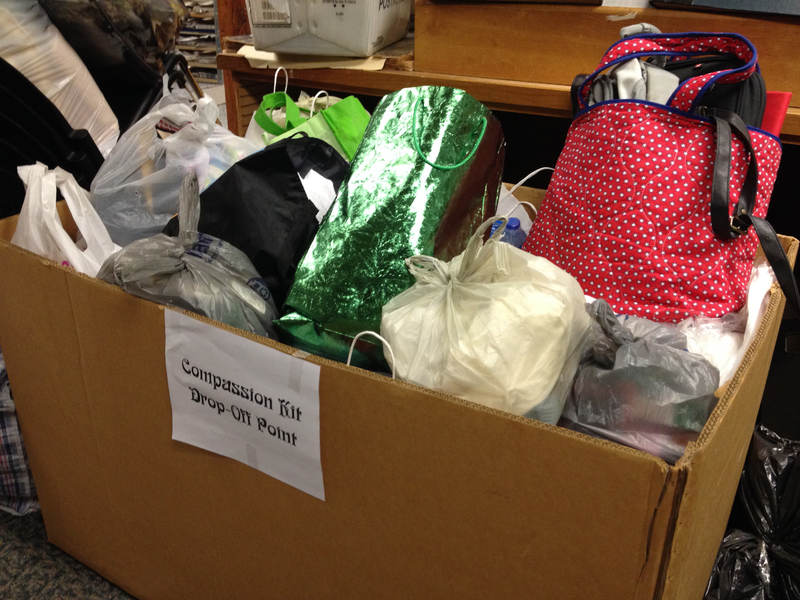 The drive wrapped up on Friday, Jan. 24 and collected 968 items, according to Golfin’s latest article on the drive. The Register Citizen started a drive to collect items for “Compassion Kits” for the homeless on Dec. 23, ending on Jan. 24. Help us map Torrington holiday light displays! Use the form below to help us map the holiday lights on display in the city. We’ll take your submissions (addresses and photos) and record the results on the map below. Photos will be featured in an online gallery as well as in print! The Register Citizen is accepting nominations for its annual Person of the Year award, recognizing an individual who has made a significant positive impact on Northwest Connecticut in 2013. Last year, the newspaper recognized former state Sen. Andrew Roraback, who has since become a Superior Court judge. In 2011, three people were honored together, the co-founders of Torrington Downtown PartnersSteven Temkin, Steven Roth and David Bender. To nominate someone, fill out the form below or share your thoughts in the comments section of this story. 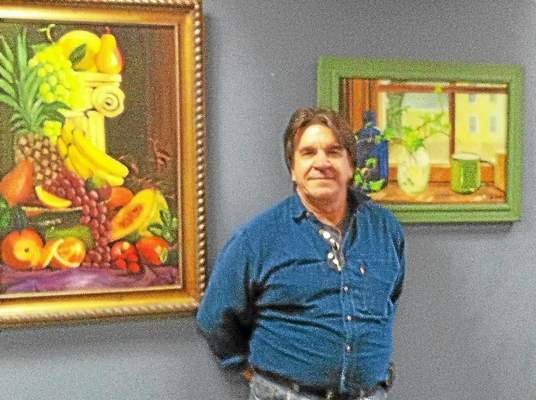 TORRINGTON >> The Register Citizen’s December Artist of the Month is German-born Bernard Jucevics. Jucevics had previously displayed his works in the cafe in May 2012, but has created many new pieces in the time since his last visit. Jucevics is a quiet man who enjoys and appreciates the beauty of nature, which is evident in the works on display for December. The walls of the Newsroom Cafe give the feeling of being in the woods, with all the green in his paintings. When deciding what to paint Jucevics thinks of the countryside in Europe where he grew up. “I love to surround myself with nature so I paint as a way to visualize where I would like to be – even if I am just sitting in my studio,” said Jucevics. Jucevics started painting as a hobby after retiring from his job. “I never expected my work to evolve into shows and sales. This has been such an unexpected blessing,” said Jucevics. Reception for Jim Koplar, November Artist of the Month, is tonight! Come on down to the Register Citizen’s Newsroom Cafe, located at 59 Field St., for an artist reception for the November Artist of the Month, Jim Koplar. The reception will be from 6 to 8 p.m. featuring cheese, crackers, punch. 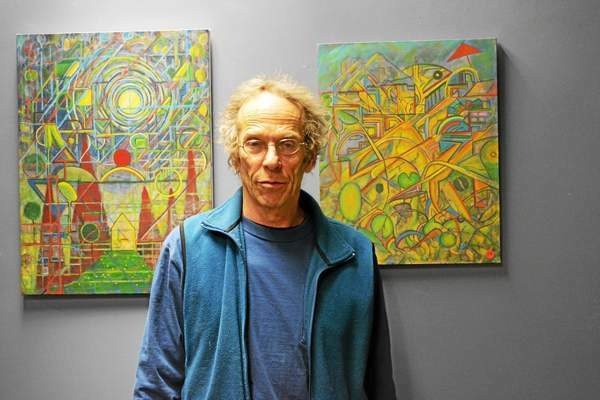 TORRINGTON >> The Register Citizen’s November Artist of the Month is city resident Jim Koplar. Koplar’s paintings are a mixture of country images and then also the nautical as well as some portraits. Koplar was drawing from his childhood but his painting didn’t become his focus until he enrolling in an adult education painting class in 1980. His art has progressed from there. “I decided to pursue a degree in fine art and explored the art of painting at a much deeper level,” said Koplar. Koplar is inspired by his surroundings. “Some time the mood leans toward nostalgic themes, other times I want to push my abilities and work in portraiture,” said Koplar. Koplar is hoping that this showing at the Newsroom Cafe will bring his works to Torrington community. He also has a new studio at Whiting Mills in Winsted. Read the full story on RegisterCitizen.com. As it turns out, having coffee and pastries for sale ended up being one of the most minor changes to our newsroom over the past six months. The idea of turning our newsroom into a coffee shop got a lot of attention when The Register Citizen Newsroom Cafe opened last December. But it’s the principles of transparency and community engagement underlying our shift to an “open newsroom” that have really made an impact on our local journalism and relationship to the community. We set out to build a newsroom that reflected our company’s mission of transforming to a “Digital First” mindset. We understood learned that “Digital First” really means “Reader First,” or “Community First.” The web has put readers (and customers of any business or organization or government, really) in charge. The web and social media give what used to be a captive audience for local newspapers a world of information sources at their fingertips, the power to be an information source themselves, and the ability to connect around common interests with friends, acquaintances, coworkers – and strangers – from here or across the world. If we are not engaging, understanding and partnering with our audience, at some date in the too-near future we will go out of business. It’s as simple and stark as that. We knew learned we couldn’t simply issue a vague invitation for readers to come down and talk to us and expect real engagement. So we set out to create a center of community offering the audience multiple ways and varying degrees of being involved with us hopefully centered around their needs and interests rather than ours. And we learned that you can’t be “Digital First/Reader First/Community First/Customer First” without being open and transparent about the journalism process. How can you “engage” without establishing a baseline of trust with your audience? Coffee shop: Yes, we have leather couches, cafe tables, an outdoor courtyard with picnic tables and coffee and pastries for sale. The Newsroom Cafe is open from 6 a.m. to 8 p.m. Monday through Friday, 8 a.m. to 5 p.m. Saturdays. No walls: There are no walls between the “cafe” and the newsroom, and readers are invited to find the reporter that writes about their community or area of interest – or editors – and talk about concerns, ideas, questions. Open story meetings: We now hold our daily story meetings in public, at a conference room table at the edge of the cafe, and the community is invited to pull up a chair, listen in or participate. Video of the meetings is also live-streamed on RegisterCitizen.Com, and we use a live chat to allow readers to watch from home and type in a question or comment in real time. Those words are displayed on a large monitor above the conference table, so editors and readers can interact and respond to people tuning in from afar. Public debate of internal policies: We learned that transparency means that, for example, our struggle over creating staff guidelines for moderation of story comments should be a discussion shared with and including the audience and story commenters themselves. And that internal policies that guide our journalism should, first of all, be written down if they exist as unwritten rules, and second, shared with the audience. 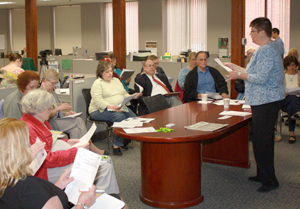 Managing Editor Emily M. Olson teaches a class to representatives from local nonprofit organizations, church and neighborhood groups on how to get their news covered by The Register Citizen. Fixing story comments: Like many newspapers and other media outlets, we have struggled mightily with a “toxic” story commenting environment. Our local school superintendent even blamed his resignation on them. We have launched a new platform that will encourage – but not require – readers to use their real identity via Facebook, Twitter or other logins. And we feel the other key to improving this vital forum is more engagement in the story comments from the staff who are charged with moderating. Digital first reporting: Digital first reporting increasingly means, for us, that the audience knows what we’re working on at the assignment stage or before (as in, the audience participating in the discussion that determines assignments). It means that we are publishing what we know, as soon as we know it, using whatever platforms are available to us, from SMS text messages and email alerts, to Facebook and Twitter, to our website. It should mean (we’re slowly getting there) that we use maps, timelines, charts, videos and slideshows to help tell the story, because it improves the story. And it should mean (we have a long way to go) that we are linking out to other sources of information all over the place to enhance the experience for our readers. Crowdsourcing: What will lead to better journalism: relying on the experience and knowledge of our staff and a handful of “official sources,” or relying on the collective experience and knowledge of our entire audience? It rings especially true on complicated or far-reaching topics, and, of course, topics that relate to the wishes of or trends among the audience itself. We fall short, and are learning as we go, but our goal is to partner with the audience on everything we do. Fact Checking: Before plans for The Register Citizen Newsroom Cafe were on the drawing board, we launched a “Fact Check” box at the bottom of every story on RegisterCitizen.Com. Readers and sources can call or email an editor, of course, if they want a correction made, and often readers point out errors in the comment section beneath articles. “Fact Check” was a clear, prominent, public statement of accountability to our readers and sources. “Institutional media,” including small community papers such as ours, fails to realize sometimes that a reader does not necessarily assume that we are open to admitting errors and being corrected. In fact, some assume that we make errors on purpose, because of some secret agenda to twist a news story. And on a more practical level, we don’t realize how impossible it is for the average reader to even get a hold of a live person in a newsroom and get a response. In addition to the prominence and ease of submitting error reports, of course, what we do with those reports is of obvious importance. Launching the Fact Check program led us to create a formal corrections policy, post it on the web for readers, and to note corrections both at the bottom of the story in question and on an online corrections page. When the Washington Post launched a Fact Check program of its own earlier this year, we saw opportunity to improve what we were doing. Using a Google Docs form modeled after theirs, we’re now using Fact Check reports to build a database of error patterns and prospective sources/local experts to turn to in the future on stories that we’ve gotten wrong once. Community Media Lab: In 2010, part of Journal Register Company’s “Digital First” strategy meant that each of its local newspapers established a “Community Media Lab” aimed at partnering with local bloggers and recruiting new ones. The difference between our approach and similar efforts in the past is that we do not seek to “own” or control their content. We are just linking to and helping promote the work bloggers are doing on topics or in neighborhoods that we don’t have the resources to cover. They get the “fire hose” of our audience traffic directed at their site, and we get to offer a more comprehensive package of local news and information to our readers via aggregation and curation of outside work. In many cases, we become collaborators … tipping each other off to and cooperating on important local news stories and features. At The Register Citizen, the Community Media Lab has a physical presence. We have four computer workstations in the Newsroom Cafe that local bloggers and citizen journalists can use. They are loaded with free “open source” word processing, picture and video editing, web design and blogging software to show that as long as they have the time to devote to it, there is virtually no cost barrier to blogging. The Register Citizen also has a full-time community engagement editor dedicated, in part, to working with and training local bloggers. And we regularly host classes in the Newsroom Cafe on “Blogging 101” and on topics related to writing, technology and journalism. Partnerships: A new “news ecosystem” has emerged in Connecticut as laid-off newspaper people have emerged as journalism entrepreneurs and bloggers. Meanwhile, “mom and pop” hyperlocal sites and local bloggers have popped up to both fill voids left by reduced coverage by traditional media and to provide coverage that wasn’t even possible in the heyday of newsroom staffing. We have formal partnerships with CT Mirror, a nonprofit model news organization providing some of the best state government coverage Connecticut has seen in years, and CT Watchdog, a consumer advocacy site created by the former business editor of the Hartford Courant. In both cases, we swap headline links and we have the ability to use content from these online-only news operations in print. Beyond partnerships with other media – be it traditional or “citizen media” – we want the Newsroom Cafe itself to be a platform for partnership and collaboration. For example, read up on how the mission of libraries is changing. It seems like the work of newspapers and libraries is heading toward pretty similar realms. Why shouldn’t we be working on joint projects with libraries and historical societies? If the United Way needs to conduct a “community needs assessment,” doesn’t that fit with what we are trying to do as a journalism organization aiming to chronicle and put in context the health, needs and problems of our community? Curation: The explosion of sources of information that exist today because of the web only increases the need for journalists to sift through and make sense of it. And so The Register Citizen created its first full-time “curator” position earlier this year. Jenny Golfin works an early morning to mid-afternoon shift and is charged with providing our readers with an overview and links to news that would be relevant to them outside of what our own staff produces. That can include local bloggers, hyperlocal and specialty websites and traditional “competitors” such as newspapers, radio and TV stations. It also includes curation of information shared by the audience itself, via social media such as Twitter, Facebook and YouTube. This is especially significant in breaking news situations where participants or neighbors are reacting. On a recent weekday, the most-read story on RegisterCitizen.Com (after the police blotter, of course, was a photo, two sentences and a link to a “mom and pop” hyperlocal site’s coverage of the dismantling of an historic local barn. In the old days, we would have assigned our own reporter to that story and duplicated the effort. Instead, we pointed our readers to their excellent coverage, and freed up our reporter to provide readers with more local coverage. Open Archives: The most popular feature of The Register Citizen Newsroom Cafe, hands down, has been public access to 134 years of our newspaper archives. We invested in a new microfilm machine when we opened that not only prints to a laser printer, but also can scan articles in PDF format to be downloaded to a flash drive or emailed. The archives have been used by community members every single day since we opened last December. Community Classroom: One of the biggest symbols of change for us with our new office was building a classroom right into the newsroom. From reporters, editors and advertising reps, right on up to the publisher, we have to learn a new mindset and a new set of skills to become a “digital first” company. And because we’ve stepped away from the reliance upon a single platform (print) into a future of unknowns, we have to be in the mode of continual learning. In a sense, we’ve invited the community on this journey with us. Each month we hold various classes and workshops on topics of technology, writing and journalism, all open to the public and live-streamed on the web. At a series of classes on the Freedom of Information Act, for example, members of our staff were sitting in our classroom alongside local bloggers, residents and even local public officials. Community Meeting Space: We’ve made our classroom, which has video conferencing capabilities via a good web cam, large flat-screen monitor and Skype, along with a small conference room and our cafe area (which holds more people), available free of charge for use by community groups. This – along with our own scheduled classes and workshops – has brought a steady stream of new people into our newsroom, exposing them to the behind-the-scenes effort behind The Register Citizen for the first time, and introducing us to new sources. A new kind of editorial board meeting: A funny thing happened after we moved into the “open newsroom” last December. We stopped having “editorial board meetings,” at least in the traditional sense where an outside organization or politician meets behind closed doors with a committee of editors, reporters and the publisher. We were still getting requests, but when we did, we made sure the industry association or special interest in question knew how we do things now. We’ll meet with you, but it will be in public, our readers will be invited to attend and participate, and we’ll be live-streaming it on the web. For the most part, after that became clear, the party requesting the editorial board meeting said “No thanks.” Others, including Connecticut Governor Dannel Malloy, embraced it, and the public’s involvement, by all accounts, improved and advanced the discussion. An exciting opportunity has emerged for us to create a new kind of editorial board process. Free wifi:Free wifi is at a premium in Torrington. There’s McDonald’s, or Panera Bread way up on the other side of town. We offer free, reliable, no-password wifi in a comfortable coffee shop-style environment where customers aren’t even required to buy anything in order to hang out and work. It’s been a big draw with students and young professionals in particular. 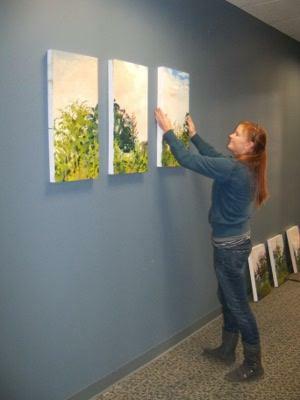 Jessica Bartlet, a Register Citizen Newsroom Cafe "Artist of the Month," hangs one of her paintings. Artist of the Month: Torrington is an old New England mill town whose heavy manufacturing base literally made the parts that went into the machines that built the Industrial Revolution. Those mills are gone, and arts and culture is seen as one niche that could help fill the void in the local economy. The Register Citizen Newsroom Cafe is supporting a growing community of artists by providing exhibition space. Each “Artist of the Month” is featured in a Register Citizen article to kick off the display of their work in our space. And it’s potentially a minor new revenue stream. Earlier this year, we earned our first commission from selling a piece of artwork we had displayed. Used book sale: A frequent complaint in discussions of downtown revitalization and economic development in Torrington is the fact the city doesn’t have a bookstore of any kind. So a natural fit with the vibe of The Register Citizen Newsroom Cafe is a corner devoted to a used book sale. Proceeds benefit our Newspapers in Education program. Shovel brigade: Community engagement for The Register Citizen has included efforts to connect our readers with each other around common interests or needs. One example was an idea that we borrowed from our sister paper, The Middletown Press. Northwest Connecticut had record snowfall in the winter of 2011, to the point where elderly residents were shut in and roofs were collapsing. The Register Citizen organized a “shovel brigade” in which able-bodied readers (or those with snow blowers) registered their names and availability with us. Readers who needed help registered also, or were referred by local agencies, and we paired them up. Earthquake help: When a major earthquake hit Japan earlier this year, a number of people in our coverage area scrambled to find information on the well-being of friends and families in that country. We invited the public into The Register Citizen Newsroom Cafe as a resource center for this, offering free Internet access and reporter assistance in searching missing person databases set up after the quake, and a comfortable place to watch the live coverage of the quake on cable news channels. 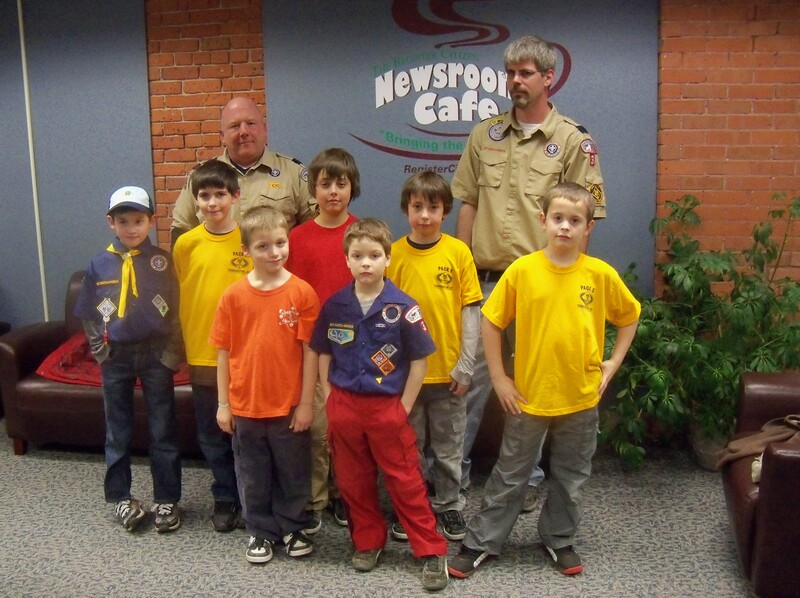 A local Cub Scout pack stopped to pose for a photo on a visit to The Register Citizen Newsroom Cafe. Cooling center: The extreme weather continued in the summer of 2011, and during several humid, high-90-degree days, The Register Citizen Newsroom Cafe opened as a “cooling center” for elderly and poor-health residents who lacked air conditioning. When Hurricane Irene hit Connecticut, and many in the region were without electricity or Internet access for nearly a week, The Register Citizen Newsroom Cafe still had power and was a resource for people who needed to check email and charge up laptops.